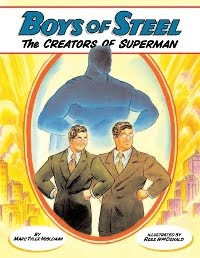 While there are plenty of storybook biographies of history's most famous and important people, never have I seen one that fits both of my two book sites so perfectly (Comics in the Classroom and The Kid's Book Corner Blog): Boys of Steel: The creators of Superman . This new storybook biography, written by Marc Tyler Nobleman and illustrated by Ross MacDonald, explores Jerry Siegel and Joe Shuster creation of Superman. Marc was kind enough to join us for an interview. Scott Tingley – Comics in the Classroom : Marc, thank you for answering a few questions for us. We'll get to your new book in a moment, but please start by telling us about your career up to now. Marc Tyler Nobleman : My first job after college was in book marketing. My first published book came out in 1996. Since then, I've written more than 70 other books for young people (and marketed many of them as well!). Much of it is nonfiction though I have done some fiction, and some of it involves humor (even some of the nonfiction). I've also written for magazines including Nickelodeon. One of the most rewarding aspects of my job is that it brings me before groups of students in schools, where I get to share with them the behind-the-scenes of an author. CitC : Why this book? What drove you to write a story book about comics in general and about the creators of the comic book superhero specifically? Were you a comic reader growing up – are you still a comic reader now? MTN : I chose to write on this subject on for several reasons. My fondness for Superman goes back to when I saw Superman: The Movie at age six (in my pajamas, front row). He's one of the most iconic fictional characters in the world so it's astounding how so few know who created him or when or where or why. Any setup like that—a recognizable entry point but a mystery backstory—has great potential for a book! It fills a gap in the marketplace, and luckily, it's an engaging story. I grew up reading DC Comics (and watching Super Friends cartoons) and I still do read certain comics. 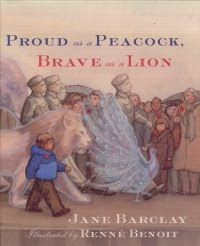 CitC : When I first heard of your book I kind of assumed that it would be in the form of a comic book, but instead, for the most part, it is in the form of a traditional story book biography. Did you and artist Ross MacDonald intend for it to be like this from the beginning or was the decision to go this way made later in the creative process? MTN : Picture books and comic books are first cousins, of course, but I wrote Boys of Steel to be a picture book. Some editors who rejected it suggested I reimagine it as a graphic novel, but I felt that was too obvious. In my mind, a comic book about comic book creators would not stand out (based on that alone), but no comic book creators had been the focus of an illustrated picture book before. That said, I did want one particular spread to resemble a comic book—the scene in which Jerry Siegel was kept awake one night by ideas that would coalesce into Superman. By having only that spread look like a comic, I was hoping it would signal to readers “Okay, this is a significant moment” and propel them with even more enthusiasm through the second half of the book. 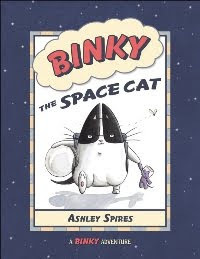 CitC : Was this book written like a comic or like a more traditional story book? What I mean by that is, as the writer, did you control the visuals as a comic writer does or was it more like how a traditional storybook gets made with the writer just providing the words with the artist filling in the visuals (at least that is how I understand the process usually works). I ask this because many comic fans understand the basics of how a comic is created: the writer writes and the artist follows the writer's instructions. This varies, of course, but this seems to be the basic model and I think comic fans are surprised when they find out how different kid's books / story books are created. MTN : I tried to write the book so that the illustrations would convey some of the information. For example, the story proper (the illustrated main part of the book, not the text-only author's note) does not contain the word “ Superman ” even once—after reading it you may think it does, but you'd just be remembering the images of Superman in the book. After I sold the book and the publisher hired the illustrator, the wonderful Ross MacDonald, I was able to pass on to Ross my suggestions for art. He was under no obligation to take those suggestions, but in many cases he did, which I was thrilled about. I also passed on to Ross many historical images for reference, and he used those as well. And I got to weigh in on the sketches. But I did not have final say on the art. CitC : Did you have a hard time selling the publisher on this idea for a biography? Were they open to this idea or did you need to convince them (which betrays my naiveté – for all I know every book is a hard sell). MTN : The book was rejected by 22 publishers, so I'd say I didn't have the easiest time selling it! But it takes only one yes. I didn't have to convince them—they read it and either they wanted it or they didn't. I did try to be strategic about which editors I approached. I focused on ones who had experience with picture books on pop culture subjects (as opposed to what I call “textbook names,” like Ben Franklin or Rosa Parks) because I figured they'd be more open to a book on the creators of a superhero. And sure enough, it was an editor who did a book on Dr. Seuss who took on mine. CitC : In your research for this book did you have the opportunity to speak with any members of Siegel or Shuster's family. MTN : I tried but I did not hear back. In only the few short years since then, I've become much more determined in my research! CitC : The main part of the books tells the story of two young men sticking with their creations and making it big. However, the final three text pages tells of their battle with DC comics to get some recognition and royalties for Superman - something comic creators were not given at the time. Why leave it to the end like this? Why not do a couple of illustrated pages to get this information across? MTN : Great question. Two-part answer. Part 1: I probably wouldn't have had room, plain and simple, given the conventions of the format. Part 2: Comics people know the story. It's widely regarded as the industry's most profound tragedy. And most every time the story is told, it ends on a sad note: two creators who've spent much of the second half of their lives suffering. For once, I thought it would be nice to let their story end on a high note. So I ended when things were never higher: right after Superman debuted and had become an instant phenomenon. I wanted to remind people that the legacy of these two guys is not that they were martyrs but that they were visionaries, and they did get to enjoy that. To be clear, I did it this way only because I did address their hardships in the author's note—if that wasn't there, I would have had to mention it in the story proper or else it would be hugely misleading. But I feel it was a great compromise—end on a high note yet still discuss the rest of their lives in an “optional” afterword. CitC : Is there anything else you would like to tell the readers here? Anything else about the book or about new projects coming up? MTN : Don't get me started! Well, for those interested in the research and the promotion of the book, my blog shares many behind-the-scenes stories: http://noblemania.blogspot.com. I've got several more nonfiction picture book manuscripts in the works. One is about the secret co-creator behind Batman. Thanks for your interest! CitC: Thanks for your time. Boys of Steel is available now and would be a great addidtion to any library, classroom or home.